Just two weeks after the 2012 election, Maine Democrats are already talking about the next one, specifically the 2014 race for governor. Their message? Third place is not an option. “The Democratic Party is going to run a serious, well-financed campaign,” said state party chairman Ben Grant. “We’re not backing down from any challenge, whether it comes from (Gov.) Paul LePage or Eliot Cutler,” the presumed independent candidate. Inherent in such a declaration is the admission that Democrats settled for third in this year’s U.S. Senate race and that a similar finish in the 2014 gubernatorial contest is a possibility. The party’s candidates scored significant electoral victories this year, keeping both of Maine’s congressional seats and taking back the Legislature after losing it in 2010. Nonetheless, big challenges loom in a governor’s race that could replicate factors that left Democrats third in the past two statewide elections. Grant is acutely aware of the dynamics, which center on the possibility — if not likelihood — that Cutler, who finished second in 2010, will run for governor again. It’s why Grant, emboldened by the legislative victories, is talking up 2014 now and assuring party loyalists and opponents that Democrats will invest heavily in the race. Grant is pinning the party’s hopes on its stars or a meteoric rise by lesser-known candidates. He also is urging the newly elected Democratic majorities in the House and Senate to resist the urge to joust with a Republican governor who often appears to spoil for a fight. There’s also a political calculation: Two years of gridlock and sparring with LePage will bolster the message advanced by Cutler and other independents that the two-party system is the problem. U.S. Sen.-elect Angus King made hyper-partisanship the staple of his campaign this year, and Cutler did the same in 2010. Cutler, of Cape Elizabeth, has not announced his 2014 candidacy but has maintained a high profile since finishing a close second to LePage in 2010. Soon after the 2010 election, Cutler established OneMaine, a group promoting independent candidates and centrist politics. He also served on the board of directors of Americans Elect, the national group that was established to put an independent presidential ticket on the 2012 ballot but later bought campaign ads on King’s behalf. Brewer, the UMaine professor, said he believes that Cutler will run in 2014. His campaign apparatus is in place with OneMaine. A divisive political climate in Augusta could make another run even more enticing. The race is also set up well for LePage, who, as Brewer noted, likely needs a viable third candidate to pull off a repeat of 2010. 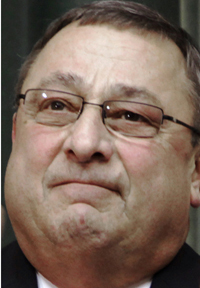 Nobody appears certain that LePage will seek a second term. His supporters set up his re-election campaign committee in January, and the group Maine People Before Politics has been the governor’s political arm since his inauguration. But the governor, whose favorability rating has remained mostly steady according to periodic polling, has not said that he definitely will run. Last week, he told Politico that he was unsure. If Cutler is in the race, it may not matter to Democrats if Le- Page seeks re-election; the party could still face the prospect of an independent dividing the unenrolled and progressive voters. Democrats also have a candidate problem. U.S. Reps. Chellie Pingree and Mike Michaud are established stars. But will they run for the Blaine House? Too soon to tell, Grant said, but either would immediately change the contours of the governor’s race. Pingree is married to S. Donald Sussman, the majority shareholder of MaineToday Media, which publishes the Portland Press Herald, the Kennebec Journal and the Morning Sentinel in Waterville. Brewer isn’t convinced that Pingree, who represents Maine’s 1st Congressional District, is a good statewide candidate because of the conservative 2nd District. Michaud is another story. Grant dismissed suggestions that Michaud could face pressure from national Democrats not to give up his seat in the U.S. House. Absent a run by Michaud or Pingree, the party would have to draw from a pool of candidates who may not be ready, or known well enough, to run for governor. The party’s losses in 2010 hampered its ability to fortify its bench — state commissioner positions or constitutional officers — and elevate its public profile. Grant hopes that the party’s control of the Legislature will fix that problem. He said it will evaluate the presumptive favorites to become the state’s constitutional officers, Matt Dunlap (secretary of state), Janet Mills (attorney general) and Jeremy Fischer (state treasurer), as well younger figures: former House Speaker Hannah Pingree, current House leader Emily Cain, incoming Senate President Justin Alfond and incoming House Speaker Mark Eves. It’s not known whether any of those prospective candidates will be ready for prime time by summer of 2013, when Grant hopes Democrats will begin uniting behind one candidate. Nonetheless, he said the party, and opponents, should know that Democrats won’t sit out 2014.